As part of my yearly review process, I looked back at my credit card statements to see what I bought this year. 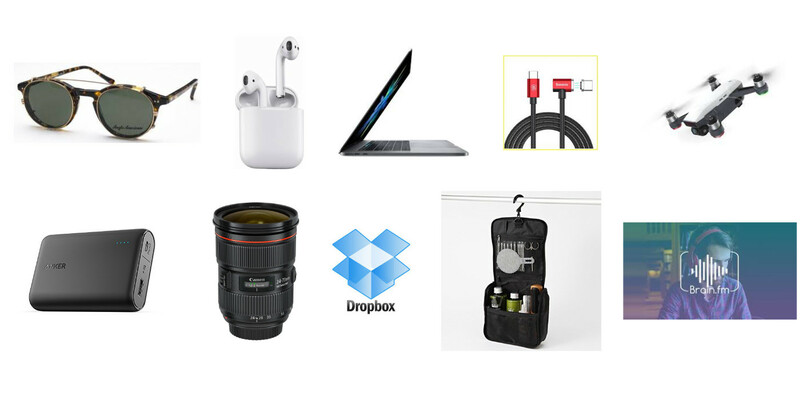 As a self-proclaimed minimalist I don’t buy a lot of stuff in the first place, but nevertheless there were a few purchases that did significantly improve my daily life this year. I hope they’ll serve you well too, if you decide to try them out! While attaching these to my glasses admittedly makes me look somewhat Mad Scientist-y, I can now finally be out in the sun without squinting my eyes like a madman. Absolute game changer! I hate cables to an irrational degree, so cord-cutting is always very welcome. I thought it would be too extravagant to own both airpods and Bose QC35 headphones, but I’m glad I finally went for both of them (Bose for airplanes, trains and the office, Airpods for walking around). The Airpods went way above and beyond my expectations. Biggest purchase of the year – worth every penny. This thing is fantastic. And the hourly cost of ownership amortised over a my typical 5 year computer owning period actually is very reasonable. This tiny thing fixed the fantastic new Macbook’s only problem – the lack of a MagSafe power plug! So. Much. Fun! I love flying this thing at MIT in Boston, at Babson College, or on the beach in Thailand. The birds’ view of things is amazing! I can’t believe it took me so long to get a proper power pack. Now I never have to worry about running out of phone charge ever again. NICE! This big beast works for “everything” – I can now shoot 70% of my photos without changing lenses. I love MUJI’s minimalist style of just about everything, and this thing is no exception. I can now stay super organised in the toiletry department while on the road. It’s always pre-packed and ready to go. One of the only productivity enhancing tools that actually work for me is Brain.fm’s binaural beats “music”. It may very well be placebo or auditory snake oil, but I don’t care as long as it works for me. Having used it so often, I can now, Pavlov-style, get in the productivity zone just by turning these weird sounds on. You can try it a few times without purchasing a subscription – I recommend giving it a shot! There you have it – ten purchases that have made me better off than a year ago. I believe they can do the same for you. Happy new year!